Speaking of Davis, did you wonder where he was last weekend since he wasn’t at the Valero Texas Open? His daughter, Lexie, got married at the family’s beautiful St. Simons Island, Ga., house – under the exact same tent used for The McGladrey Classic pro-am draw party! That’s big news for not only the Love family but for the entire McGladrey family. Congratulations to the Love family on this wonderful occasion! Not only was this past weekend exciting, but next week is a big one with the Masters taking place in Augusta. Team McGladrey Member Zach Johnson will be playing. The field is now set for the Masters, with the exception of the winner of the Shell Houston Open (unless the winner is already in the Masters field). You might be surprised to not see a “certain someone” in the players field this year – it’ll be the first year in his career that Tiger Woods won’t be playing in the tournament. Read what some of his fellow PGA TOUR professionals had to say about Tiger missing the Masters due to recent back surgery in this PGA TOUR article. Tiger, we hope you feel better soon. While Zach isn’t playing this week, he’s still been busy. On Tues., April 1, Country Inns & Suites By CarlsonSM announced their new three-year sponsorship of Zach. Check out the announcement, in Carlson’s news release. 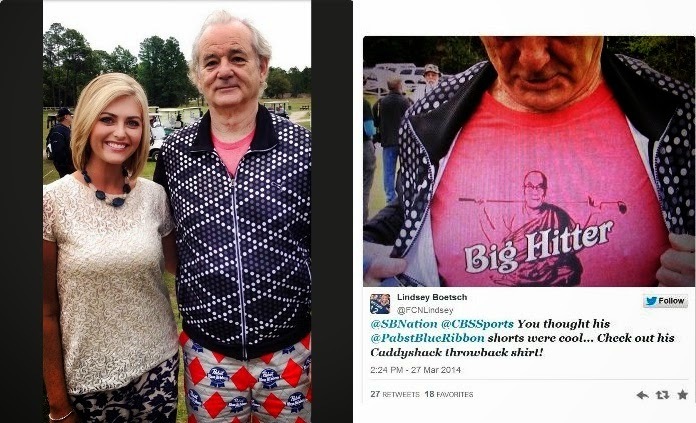 Bill Murray recently rocked one of the funniest outfits we’ve seen on a golf course while attending the 14th Annual Murray Bros. Caddyshack Charity Golf Tournament. Like The McGladrey Classic, the Murray Bros. tournament helps raise funds for charitable organizations. Finally, as a reminder, new volunteers can now sign-up to support the 2014 McGladrey Classic.. Volunteering for the event is a great way to get an inside peek at the inner workings of the tournament, while enjoying the beautiful Sea Island scenery and contributing to the success of the event. Interested? Sign up here. In closing, we’d like to share an incredible story about PGA TOUR caddie Paul Tesori, his wife, and their son Isaiah. It’s a touching illustration of the close-knit nature of the PGA TOUR community. If you have a few minutes, read the story. We guarantee it’ll touch your heart. Check back next week for more updates on Team McGladrey, the 2014 McGladrey Classic and all other golf-related items.